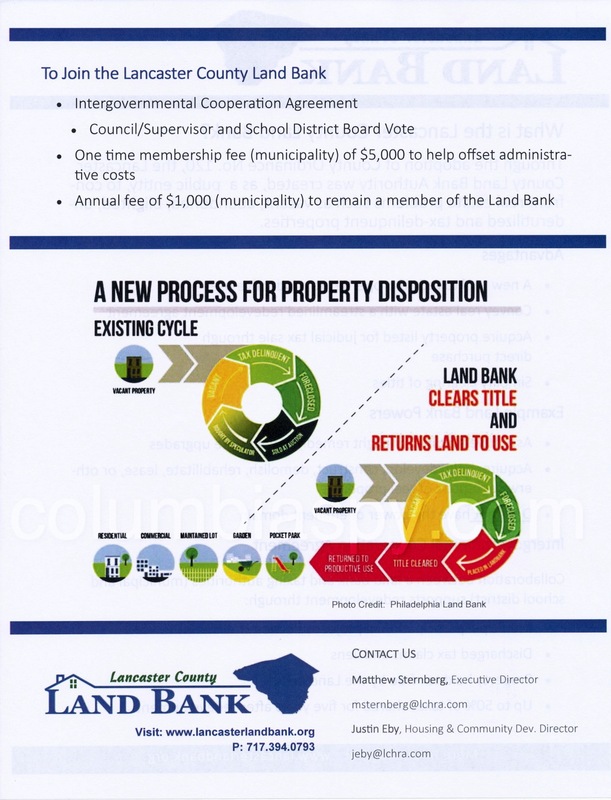 There's a new way for Columbia to confront vacant, abandoned and blighted properties: the Lancaster County Land Bank. 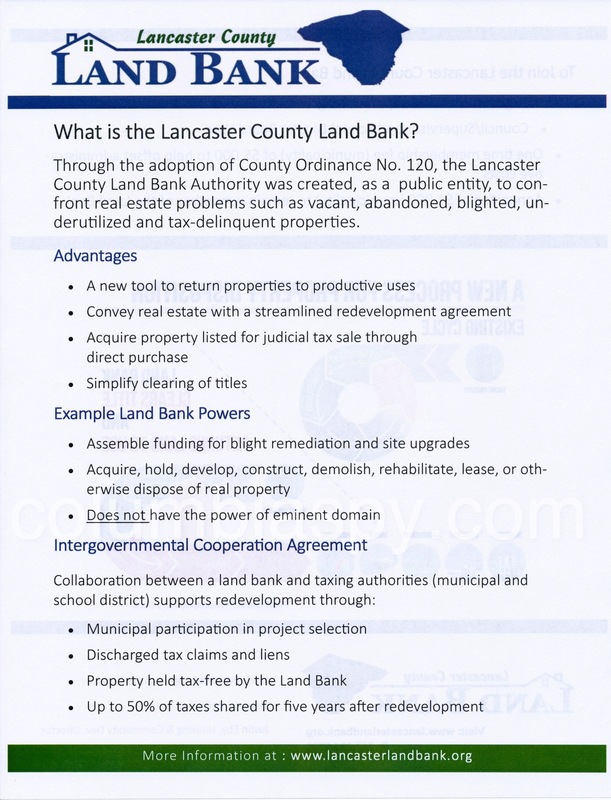 Matthew Sternberg, executive director of Lancaster County Housing & Redevelopment Authorities, gave an "information only" presentation about the Land Bank last Monday night at a joint meeting of the Columbia Borough Council and the Columbia Borough School Board. Sternberg described the concept as a collaboration of the borough, the school district, and the Land Bank, providing a means for remediation of blighted and other troubled properties. The entity does not have eminent domain powers (as a redevelopment authority does), but it can assemble funding for blight remediation and site upgrades, and can acquire, develop, demolish, or otherwise dispose of real property. A land bank also has the ability to buy a property prior to a tax sale to properly revitalize it and can even extinguish outstanding liens. According to Sternberg, the objective of the land bank process is to rehabilitate a property and get it back on the tax rolls at a much higher level. Columbia Borough currently has 26 properties in various stages of blight. Sternberg said that no other municipalities have finished the process of joining the Land Bank yet, which entails a one-time membership fee of $5,000 and an annual fee of $1,000. This Land Bank thing sounds like another level of tax-payer funded bureaucracy !, put together by a bunch of people that want to better secure their own jobs and further justify their own existence. 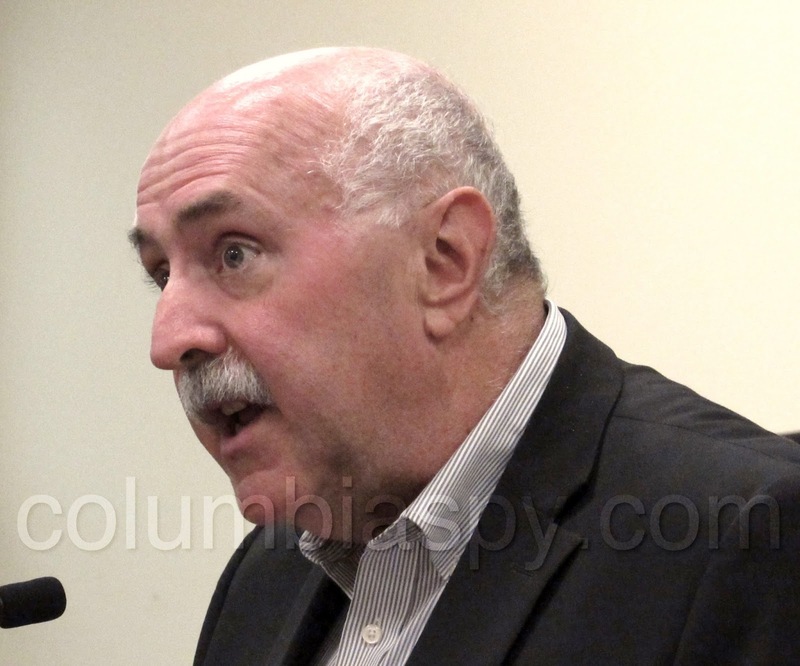 Columbia can control it's own destiny by simply ramping up Code Enforcement. Turning these properties over to a Land Bank will take the properties off the tax rolls while the friends of the higher ups get contracts to waste more tax payer money on the properties ! Columbia will make out better if we just use our existing Code Laws, and FINE the heck out of the owners of our own blighted properties ! When the owners can't pay the fines, or can't pay the Real Estate taxes, place the mechanics liens and force the sale of the properties ! That KEEPS the properties ON the tax rolls and forces the properties to sell in to new private hands using new private money, rather then wasting our tax dollars funding another level of Bureaucracy ! Don't do it Columbia ! Let the rest of the County play that game, but not us, Please !! Yeah lets let the leaders of Columbia straighten this mess out on their own. After all they've done such a bang up job to this point. Exactly, merge the school district and regionalize the police department. We must have tax relief here and now.